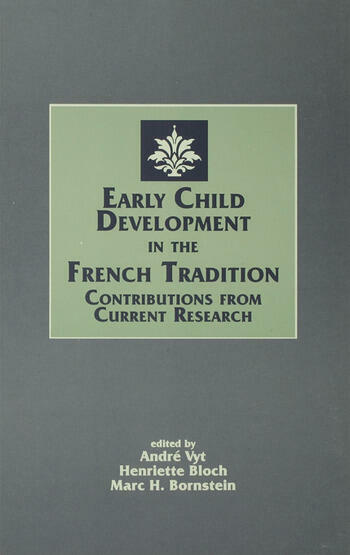 This volume shares significant contemporary "Francophone" contributions to developmental psychology outside geographic and intellectual borders of French-speaking countries. Except for the spread of Piagetian theory after World War II into Anglophone psychology, these new publications have not become so well known worldwide as progress in Francophone developmental psychology warrants. However, the work of a new generation of developmental theorists and experimentalists continues to shape important and original lines of thinking and research in France, Canada, and in other French-speaking countries. This work also contributes uniquely to issues such as sensori-motor development, perception, language acquisition, social interaction, and the growth and induction of cognitive mechanisms. Scientific concepts are not only embedded in a paradigm, but also in a culture and a language. Instead of writing about Francophone developmental psychology from "outside," this volume brings together original English-language contributions written by researchers working in different Francophone countries. Chapters summarize and interpret research on a given topic, making explicit the context of philosophical and theoretical traditions in which the empirical advances are embedded. Original essays are accompanied by editorial commentaries from eminent scientists working on the same topics in other parts of the world -- topics that are closely related to Francophone streams of thought and themes of study. Together, these essays fully and faithfully represent modern scientific perspectives toward understanding many facets of mental growth and development of the young child. Contents: Preface. H. Bloch, A. Vyt, M.H. Bornstein, An Introduction to Francophone Research and Thinking in Developmental Psychology. Part I: Sensorimotor Development and Perception. P. Rochat, A. Bullinger, Posture and Functional Action in Infancy. S. de Schonen, C. Deruelle, Pattern and Face Recognition in Infancy: Do Both Hemispheres Perceive Objects in the Same Way? G. Malcuit, A. Pomerleau, A Functional Analysis of Visual Fixation, Habituation, and Attention in Infancy. R. Lecuyer, A. Streri, How Should Intelligence Be Characterized in the Infant? Commentary: G.E. Butterworth, Sensorimotor Development and Perception From Francophone Perspectives: An Appreciation. E.S. Spelke, Developing Knowledge: Diverse Perspectives and Common Themes. Part II: Sociocognitive Development. M. Ricard, T.G. Decarie, S. Desrochers, T. Rome-Flanders, From "Cold-Blooded" Cognition to Social-Cognitive Development. A. Vyt, Self-Recognition in Infants: Some Reflections Beyond the Mirror. J.C. Fraysse, A. Desprels-Fraysse, Inducing Cognitive Strategies. C. Vandenplas-Holper, Action, Interaction, and Cognitive Development: Process-Oriented Research With 5- to 8-Year-Old Children. Commentary: P. Bryant, The Roots of Intellectual Development. M.H. Bornstein, Francophone Perspectives on Cognition and Social Cognition in Preschool-Age Children. Part III: Verbal and Communicative Development. J. Nadel, The Development of Communication: Wallon's Framework and Influence. B. de Boysson-Bardies, P. Halle, Speech Development: Contributions of Cross-Linguistic Studies. D. Poulin-Dubois, S.A. Graham, Infant Categorization and Early Object-Word Meaning. J.E. Gombert, Development of Meta-Abilities and Regulatory Mechanisms in the Use of Linguistic Structures by Children. Commentary: H. Papousek, M. Papousek, Language and Thought in Children: A Look Behind Curtains. P. van Geert, Francophone Views on Verbal and Communicative Development: A Non-Francophone Commentary. Part IV: Interaction and Development. M.G. Pecheux, F. Labrell, Parent-Infant Interactions and Early Cognitive Development. B. Pierrehumbert, E. Fivaz-Depeursinge, From Dyadic To Triadic Relational Prototypes. M. Provost, Day Care and Social Competence in Preschoolers: Continuity and Discontinuity Among Family, Teachers and Peer Contributions. C. Sabatier, Parental Conceptions of Early Development and Developmental Stimulation. T. Blicharski, F. Gravel, M. Trudel, Representational and Communicative Processes in the Social Construction of Early Temperament. Commentary: B. Caldwell, The French Tradition From the American Perspective. H. Rauh, Interaction and Development: Francophone, Anglophone, and Germanophone Perspectives? "It presents unique perspectives on perception, cognition, and communication in human development....achieves an overview of research and thinking toward filling a gap in internationalization of developmental research....will be of interest to researchers in early child development....well-organized and readable and represents a unique resource to the English-speaking developmental psychologist." "...as a source of reference as well as a flavour of what is happening in French-speaking developmental psychology, well worth reading."